The huge enthusiasm for Bernie Sanders’ call for a political revolution has led to a serious challenge to Hillary Clinton in recent weeks. This was shown most clearly by Sanders’ landslide win in New Hampshire and his dramatic gains in many state and national polls. Sanders came in first place in a national poll for the first time in the week leading up to the caucus. The establishment has watched in shock as Clinton’s campaign faltered and lost momentum, and the once all-but-certain anointment of Hillary has been called into doubt. Even The New York Times editorial board was alarmed enough to weigh in publicly on the race, critiquing the tactics of the Clinton campaign and urging corrective action. The Sanders campaign has continued to set records for number of donors in a presidential race: now with over four million individual contributions. It is the first time many of his donors have ever given money to a political campaign, as they see the opportunity to support a presidential candidate not owned by Wall Street. But the Clinton campaign appears to have been able to regain its footing in Nevada. Clinton held on to score her first clear victory over Sanders: 52.6% to 48.3%. Following disappointing results in the first two primary states, this result helps Clinton to reestablish some momentum. The victory was secured with support from powerful establishment figures like Senate Majority Leader Harry Reid, and backing from conservative union leaders. Reid weighed in behind the scenes to mobilize support, including helping to bring large numbers of casino workers to vote for Clinton in the caucus – a decisive move that helped swing large numbers of delegates. Unions carry significant weight in Nevada and the union vote went 54% to Clinton. Sanders had made major inroads against the support Clinton had long enjoyed in the swing state of Nevada, with a 23-point lead as recently as late December. Again Sanders was able to win overwhelming support from young people, with 82% of under-30 voters. The relatively narrow loss shows the strength of Sanders’ campaign and enormous support for his anti-corporate program, with demands like a $15 minimum wage and free college tuition paid for by taxing Wall Street. But the loss, and particularly Clinton’s continued strong support with black voters, also reveals the serious challenges Sanders faces going forward. Sanders has made major gains in Southern states and is in contention now in states where Clinton had double-digit leads recently. In Oklahoma, he is polling only two points behind Clinton, while in West Virginia, he has pulled into a decisive lead with 57% to Clinton’s 29%. Sanders is clearly in contention or leading in at least four Super Tuesday states: Minnesota, Colorado, Massachusetts, and Vermont. But he will also need to minimize the damage in the eight other states where Clinton currently looks to win a substantial majority of the delegates. Whatever happens on Super Tuesday, the Democratic primaries will likely be a long, hard fought battle, and has already been far more competitive than Clinton, or the corporate establishment, ever expected. Both campaigns invested heavily in Nevada, recognizing the significance of a victory there following the landslide in New Hampshire and heading into the Clinton-favored South Carolina caucus (February 27) and Super Tuesday (March 1). Clinton’s campaign had characterized both Nevada and South Carolina as “firewall” states, where she was expected to win decisively because of their more diverse demographics and her stronger support with non-white voters. Clinton did win a majority of African-American voters in Nevada, as expected, but, significantly, Sanders pulled ahead of Clinton among Latino voters, winning 53%, according to exit polls. Sanders’ failure to make more substantial gains with black voters does, in fact, present a real challenge in the upcoming South Carolina primary, where a majority of Democratic voters are African American. But his strong support from Latino voters in Nevada is significant, and will become increasingly important going into March caucuses and primaries. A rank-and-file rebellion has broken out in labor over the Democratic primaries, with a majority of workers in many unions strongly supporting Sanders. It has been decades since the labor movement had the opportunity to support a clearly pro-worker presidential contender like Sanders, and the intensity of the divide between workers and conservative union leaders is growing increasingly sharp. The divide has been expressed by a few unions and locals breaking ranks and endorsing Sanders. In Nevada, this came through in the all-out campaigning of National Nurses United on behalf of Bernie. The split in labor was also underlined just days before the caucus when the AFL-CIO declined to make an endorsement in the presidential race as was expected. Clinton’s campaign had counted on this early endorsement, and its postponement is widely seen as a Sanders victory. But the majority union vote for Clinton in Nevada shows how much is at stake so long as a conservative trade union leadership continues to tilt the scales against Sanders. The corporate media has played a powerful role in defining the Democratic Primary terrain. But since Sanders’ surge in the polls and victory in New Hampshire, the media establishment has treated him differently. Recent coverage has focused on attempts to poke holes in the viability of his policy proposals and how they will be paid for. Important liberal media figures like Paul Krugman have dedicated considerable column space to attacking programs like Medicare for All, in spite of the fact that Krugman and others have long supported some of these same proposals prior to Sanders’ threat to Clinton. Following Super Tuesday, the corporate media will again have an opportunity to redefine the race, with a substantial number of delegates being assigned, mostly from states less favorable to Sanders. Corporate media outlets would like to be able to write Sanders’ obituary on March 1, if they are able, or to at least portray Clinton on the verge of clinching the win. Already, major media outlets have begun reporting superdelegates in the total delegate count, largely from states that have not even had their primary or caucus yet. This submerging of the pledged delegates into the huge pool of establishment superdelegates supporting Clinton, helps portray the primary as already a landslide and lock for Clinton. So far, the delegates pledged in the Democratic Primary are almost tied – Clinton has 52 and Sanders has 51. But when the totals are given along with “committed” superdelegates, the gap is 503 to 70. Superdelegates are one of the many ways the Democratic Party can act to protect itself from the danger of a grassroots nominee like Sanders. The system was established in the early 1980s to prevent future left-wing challenges like that posed by George McGovern in 1972. McGovern opposed the Vietnam War, supported a basic guaranteed income, and abortion rights. After failing to prevent his nomination, the Democratic Party establishment abandoned him in the general election, helping to ensure Richard Nixon’s victory. At present, the highest priority of the Democratic Party establishment is to use any means necessary to defeat Bernie before the convention. They will be hesitant to expose the undemocratic nature of their party by using the superdelegates. But if Sanders is able to win a majority of assigned delegates going into the July convention, the Democratic leadership will consider tilting the scales with the superdelegates, while they weigh it against the dangers of other options like supporting an independent pro-corporate candidate such as Michael Bloomberg. To win the Democratic primaries, and, more broadly, to win Sanders’ political program will require a massive mobilization of workers and youth to stand up against the establishment’s attempt to shut down the movement around Sanders. #Movement4Bernie was launched to build an independent force behind Sanders which can help mobilize grassroots support for his campaign. On March 27, the second #MarchForBernie will take place in cities across the U.S. #Movement4Bernie is also organizing mass meetings and debates to help build the momentum for Sanders’ political revolution. Having an independent force will become increasingly necessary, as the establishment uses all its tools and advantages to block Sanders within the Democratic Party. In spite of the enormous enthusiasm for Sanders’ campaign, we see near unanimous opposition and hostility from the party’s leadership to his campaign and the ideas he is raising. At this time, Clinton has the endorsement of 39 senators and 159 representatives. Sanders has, by comparison, no senators endorsing, and three representatives. This is at a time when national polls show the two candidates in a virtual tie for popular support and with majority support for much of his political program. We have also seen the DNC’s chair, Debbie Wasserman Schultz, and others, using their control of the debates and structures of their party to assemble as many undemocratic obstacles as possible to Sanders winning the primary. What is increasingly clear to Sanders’ supporters is that the leadership of the Democratic Party has no interest in welcoming or advancing the progressive proposals that Bernie is campaigning on. Instead, they hope to take these issues back off the table as soon as possible by defeating him. Hillary has made this abundantly clear herself in characterizing his proposals, such as Medicare for All and free college, as unrealistic and unwinnable. In order to win Bernie’s program, working people will need to build their own political party, one that takes no corporate money and unambiguously fights for the interests of the 99%. The most important development from Sanders’ presidential run, may be the beginnings of a fracturing of that party, brought about by the social forces unleashed by his campaign. In recent weeks, several petitions have begun circulating on the internet; Sanders’ supporters signing to say they won’t support Hillary if Bernie loses. 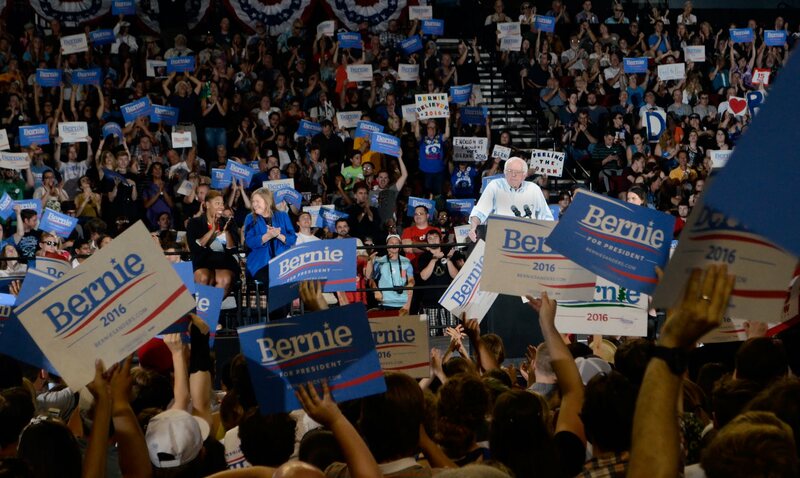 This is an outgrowth of the genuine excitement around Bernie’s campaign running up against increasingly aggressive attacks from the Democratic Party leadership combined with the exposure of Clinton’s corporate politics and record. The attacks have extended to Hillary’s husband and daughter. The “Clinton Family Circus” includes such gems as Bill comparing Sanders’ supporters to the Tea Party, and Chelsea accusing Sanders of trying to “dismantle” Obamacare. The vitriolic attacks from a long parade of Democratic Party leaders and liberal figures are also poisoning a new generation of activists against the corporate establishment of the Democratic Party. These petitions are an important development that must be supported. They show that some Sanders supporters are rejecting the Democratic Party establishment altogether, many of whom will be open to the idea of building a new party for the 99%. Many things could happen in the four months left in the presidential primaries, with 47 states and more than 4,000 delegates unpledged. It is possible that the impact of major Super Tuesday losses for Sanders could lead to a decisive shift in momentum toward Clinton. The tremendous excitement and social forces stirred by Bernie’s campaign have their own momentum as well. The question is how much that energy can be harnessed and organized toward fighting for a Sanders’ victory in the primary, and beyond that to building an independent force for the 99%?